Wide neck provides easy filling and discharge especially loose and paste-like products. Containers can be stack in 2 layers with lining material. The container can be fitted with bottom discharge valve as a good solution for summer shower that makes this product irreplaceable for household needs. 205L conical container is produced of food approved chemical resistant HDPE and is designed for transportation and storage of food and chemical products. 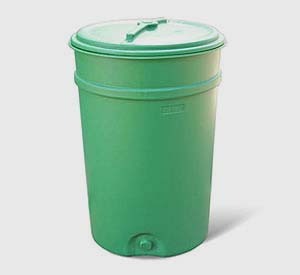 The container is produced of food approved polyethylene and can be used for pickling of vegetables, storage of drinking water and it also can be used for storage of chemicals and petrochemicals.